Morakniv® Classic has been developed by Mora of Sweden for over a century, and has been utilized by generations of carpenters and wood carvers. The tradition can be explained by the knives being pleasant to work with and having just the right feel. A reliable knife that has a given place among the tools of a handcrafter. Also used to a great extent by carpenters. Classic wood-splitting knife with carbon steel blade. Woodcarving knife with a thin, tapered blade of laminated steel. Oiled birchwood handle. Plastic sheath. Woodcarving knife with a thin, tapered blade of laminated steel. Our woodcarving knives are well known and appreciated precision tools that are used by wood carvers. Made in Sweden. Woodcarving knife with a thin, tapered blade of laminated steel. Oiled birchwood handle. Plastic sheath. Morakniv is a company with a rich history of great craftsmanship with traditional knife making techniques. Whether they are producing a hunting knife or a kitchen knife, the same detailed work goes into every piece. This clip point blade blank has a 3″ cutting edge and is made from carbon steel. Carbon steel blades are known for their hardness, but they are easily susceptible to corrosion. It is important to use rust inhibitors to protect your blade. Morakniv is a company with a rich history of great craftsmanship with traditional knife making techniques. Whether they are producing a hunting knife or a kitchen knife, the same detailed work goes into every piece. This blade blank has a 2.3″ cutting edge and is made from laminated steel. The core of laminated steel is a high carbon surrounded by a softer alloyed steel layer. A high hardness can be achieved through hardening, resulting in a knife blade with superior toughness, cutting edge retention and thereby maximum sharpness and longevity. Morakniv is a company with a rich history of great craftsmanship with traditional knife making techniques. Whether they are producing a hunting knife or a kitchen knife, the same detailed work goes into every piece. This blade blank has a 3.25″ cutting edge and is made from laminated steel. The core of laminated steel is a high carbon surrounded by a softer alloyed steel layer. A high hardness can be achieved through hardening, resulting in a knife blade with superior toughness, cutting edge retention and thereby maximum sharpness and longevity. By popular request, now available in Stainless Steel – The Mora Crook Knife 164 is a specialist hook knife for spoon and bowl carving. 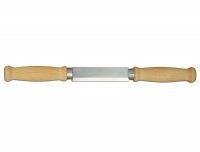 It has an oiled birch wood handle which provides excellent grip and control when carving. It will carve most types of wood including hard woods such as Cherry and Ash. Single-edged. Stainless steel blade. Oiled birchwood handle.